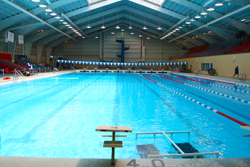 The college’s Aquatic Center took in about $75,000 less than it paid out to keep the facility open from July 2010 to June 2011. OCCC Community Development Vice President Steven Bloomberg confirmed the college’s Aquatic Center operates at a small loss each year. However, Bloomberg said, OCCC operates at revenue neutral — meaning despite the small losses from the Aquatic Center, OCCC as a whole operational entity is not losing money on a fiscal year basis. Sechrist said information from the most recent years dating back to 2008 shows Aquatic Center direct revenues do not fully cover all of the direct expenses. “For the most recent fiscal year ending June 30, 2011, the Aquatic Center earned $478,497 in direct revenue and incurred $553,414 in direct expenses,” he said. Sechrist said the Aquatic Center was never meant to turn a profit. Bloomberg said lifeguards, the Aquatic Center coordinator’s salary and about 40 percent of the director’s salary are part of the allocations to the Aquatics Center. Sechrist said the agreement, initiated in 1988 between OCCC and the City of Oklahoma City, requiring OCCC to open the Aquatic Center to members of the community for 20 years, had recently expired. The Aquatic Center was built almost 25 years ago when Oklahoma City hosted Olympic Festival ’89, with 86 percent of the funds provided by the City of Oklahoma City, according to Pioneer archives. The first phase of the Aquatic Center cost an estimated $2.2 million and was finished by Lippert Brothers Contractors and architectural firm RGDC Inc.
Sechrist said it would cost an estimated $6 million to bring the Aquatic Center to “state-of-the-art” conditions. “We worked with Triad, an architectural firm, a couple of years for maintenance issues,” he said. “The plan includes improved and expanded locker room facility. “If you’ve been in [the Aquatic Center] when a lot of people are in there, it’s very warm and we have some air handling issues. Sechrist said the diving platforms also need work. Also, the water filtration system needs to be updated in the swimming and diving wells. Sechrist said other improvements would include an ultra-violet sanitizing system and aesthetic upgrades, better bleachers, better sound system. “Triad’s estimate to do all of the things on our wish list, which would include all the things I mentioned, would cost $6 million,” he said. Sechrist said the damages caused by the flood to the Aquatic Center in the summer of 2010 did not spur the need to approach Triad for renovations. Sechrist said OCCC has not received any offers to fund renovations or to purchase the Aquatic Center, but college officials did reach out to the City of Oklahoma City. “We have approached the city regarding MAPS funds or some other funding source, but no funds have been offered to the college. Sechrist said there were two stipulations in the requested funding proposal that made it impossible for OCCC to accept. “Whatever was spent for renovations or a new building would be owned by the City of Oklahoma City and the property is not city property. It’s college [property],” he said. Sechrist said initiatives are in place, or planned, to obtain outside funding. The college is pursuing ancillary funding opportunities to bolster revenue for the Aquatic Center. Bloomberg said generating additional revenue for the Aquatic Center is not as simple as raising the prices for memberships. “With the Aquatics Center we sell memberships. Students and staff with a valid ID already pay a fee but a family from the outside will pay $220 a year for a membership,” Bloomberg said. Bloomberg said funding for the Aquatic Center is going to have to come from outside OCCC to achieve revenue neutral status. This includes additional sponsorships from the community. “For example, the last event we held — the NAIA swim and dive championships — we were able to secure donations from area business and industries,” Bloomberg said. Bloomberg said OCCC has created a position that has not yet been filled to develop grants, donations, and fundraising for community development activities. Sechrist said this year alone, the Aquatic Center has held in excess of 30 events. In addition to local Oklahoma high school teams, the Aquatic Center hosts events for the Special Olympics, Chesapeake Swim Club, Oklahoma Baptist University, NAIA National Championships, and the Mountain West Conference Diving Championships. “(With regards to) Mountain West, there’s no college in the state of Oklahoma that’s a member of that organization. Everyone that comes is from out of state. …The schools are from all over the country,” he said. Bloomberg stressed OCCC is one of the best-managed institutions in Oklahoma, maybe even in the country. Bloomberg said he encourages students to use the facilities available to them at OCCC. “The Aquatics Center, the wellness center, intramurals, even if they don’t do it weekly, it’s a real benefit to them. The staff will give them tours. We offer Red Cross swimming classes, children’s soccer, and children’s sports camps — there’s a huge spectrum of programming that goes on,” he said. Sechrist said despite the Aquatic Center not covering its direct expenses, he sees the economic benefit to renovating the Aquatic Center for the surrounding community. “Certainly, if we get the $6 million, our facility would rival any swimming and diving complex, certainly in the diving area. “[It would be ]a world class facility for our faculty and staff,” he said. “To be honest students are first. For more information about the Aquatic Center, visit www.occc.edu/rf/aquatic. To contact Joey Stipek, email onlineeditor@occc.edu.